JOSH Corner may have been down but he’s certainly not out after a spill at Round Five of the Motorpoint British Supersport Evo Championship. The South Shields teenager remains upbeat despite a heavy crash in the second race at the Brands Hatch GP circuit, where he was lucky to walk away with just a small finger injury. 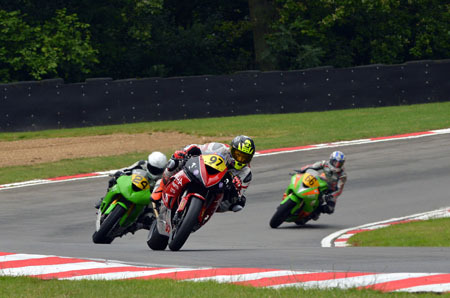 Now he is looking ahead to the next round at Thruxton in Hampshire, after a weekend where he felt he had been making serious progress with his MJJ Motorsport with Alpha Paints Ltd Kawasaki. The 17-year-old had just received the bike back from MSS Performance the day before the race weekend got underway, and spent most of Friday on set-up work. After a solid first day, he eventually qualified seventh Evo and 22nd overall for Saturday’s sprint race. A good start and strong race saw him battle through to finish fifth in Evo and 18th overall, after a fierce scrap and dice through the field. He was feeling confident ahead of Sunday’s feature race where he lined up on the sixth row in 16th spot and third in class. Although dropping a couple of overall places, Corner spent most of the race in a battle for third. By Lap Nine he was right up on David Allingham and had his eye on that third spot on the podium. But disaster struck three laps later when he lost the front at Clark Curve and crashed out. “It was just one of those things, I was absolutely gutted because the team had worked so hard and MSS had built me a mega engine, so for it to end in the gravel was not what I’d planned,” he said. “When I crashed one of my gloves flew off as I was skidding across the track and I was conscious of the need to try and keep my hand up so I didn’t get a serious injury. By the time I landed in the gravel I was badly winded so I didn’t get straight up. “By this time the marshals had reached me and were telling me to stay where I was, but I was trying to say ‘no, I’m just winded, I’m fine’ because I really didn’t want them to red flag the race on my account. “When I got up my hand was pouring with blood, it looked really bad but thankfully when I got the medical centre and got it cleaned up they found it was just a small injury which wasn’t going to be a problem. *The championship heads to Thruxton in Hampshire over the weekend August 1-3 2014 and then moves to Oulton Park in Cheshire just a week later.